Our 23" x 11" hunter green three pocket waist apron, 65/35 poly cotton twill 7.5 oz - Getting the job done is the main objective of this functional waist apron with two sectional pockets. Your brand will be in plaid sight when featured on this eye catching accessory! 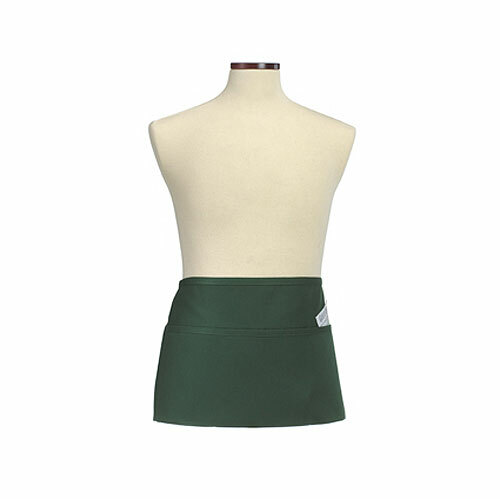 A perfect waist apron for any food service uniform, our classic short waist apron is 23 " w x 11" h and features three evenly divided front pockets and sturdy bar tacking at all stress points. Add a logo for added exposure. Short bistro style waist apron made of a 65/35 polyester/cotton twill. Front pocket divided into three sections. Extra long waist ties. Embroidery and screen printing available - 2" x 8" imprint area above pocket, 3.5" x 5" imprint area on pocket. In stock and ready to ship. 12 piece minimum. Quantity discounts available. Individually poly bagged.